On April 8, 2018, King Felipe, Queen Letizia, former Queen Sofia, Princess Leonor, Infanta Sofia and Infanta Elena visited King Juan Carlos after his knee surgery at La Moraleja de Sanitas University Hospital in Madrid, Spain. Spain's former King Juan Carlos had been operated to replaced the prosthesis of his right knee on the previous day. This was the 15th surgery he had undergone since his childhood. I'm turned off this family now which is sad as I used to think they were United. Nothing they do to make it look like happy families can undo what the video showed. Based on what I read, it was a private family holiday and the press were being intrusive. Queen Sophia was trying to be accommodating to the press, but Queen Letizia did not want her daughters to be photographed at that time. I think that is a mother's right. Letizia stepped in front of her daughters to block the shot. I don't think the two Queens were angry with each other. Seemed like it was just miscommunication. I think they are a united family and generally get along fine. No family is perfect. Agree with you Leslie R! There are no perfect families, we all make mistakes. All families have tense moments and misunderstandings, no matter who they are. Sofia was a dignified Queen for several decades and Letizia is a quite hardworking Queen now who supports many worthy causes. They all seem devoted to the young Infantas. One awkward video (which cannot be completely understood by people who weren't present) should not cause such bile against those involved. And, on a fashion note, the girls' Burberry coats are adorable. I like your opinion, Pine. I'm with you. People have been tuned into sensationalism and look for negatives first in recent decades. Common sense seems to be practically nonexistent. Thank you. Thank you, Liza. Microscopes can focus on every flaw as well as every attribute. The whole picture can even out the extremes. I agree with Pine (and Liza). Pleading for a upstanding character ... many doubts about any guilt. Both Queens look good - I like Queen Sofia's coat very much. Leonor and Sofia also look good in their trenches. My only quibble is why are they matching as if they're twins but it's minor. Glad to see that they are putting on a united front and hopefully patching up any private differences they may have. There is a revealing image of Infanta Sofía hugging her grandmather when they are leaving the hospital but Queen Sofía stays. Just behind the glass doors, inside the hospital, so not easy to see. That is real affection! Love the trenchs the girls are wearing! My only comment is, aren't the girls a little old to have their hands held all the time, especially one that will be turning 13. I can see doing it when they were younger for safety reasons. You are on point, not only on your appreciation of the situation, but on your very smart fashion sense. A vouloir demontrer à coup d images et sorties "arrangées" le contraire de ce que la presse a affiché ... la famille royale se décrédibilise. Vous êtes déterminée à continuer à marteler, n'est pas? Trouvez-vous une vie, madame potins. Or perhaps they're demonstrating the usual situation in the family - and the press hugely overreacted to and magnified a minor disagreement. Seems to me they're damned if they do and damned if they don't. I wish a happiness to Royal Family of Spain. Muchas gracias por este enlace. Muy oportuno el artículo. Totalmente de acuerdo. 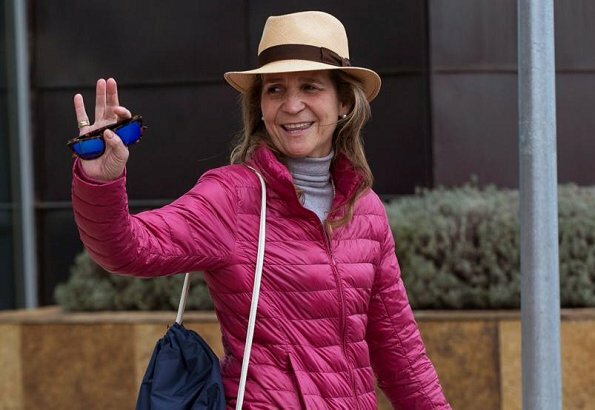 Ya está bien de machacar a Letizia. Thanks MarigoldB for the link and finally an article that speaks clearly about the Queen Letizia and every member of the monarchy. I'm so tired reading all kind of rude comments against the royal family. Thank you for the link - a very well written article which puts this in perspective. "En la vida hay tres cosas que no vuelven atrás: la flecha lanzada, la palabra pronunciada y la oportunidad perdida". No pueden pretender que nada pasó cuando todos hemos visto el vídeo. Que no hay familia perfecta es cierto, que no tenemos buenos momentos, también. Pero hay algo que como integrantes de una familia real debe procurar y es la cordura. Como dije antes son personajes públicos y saben que están en el ojo de todos. Ademas hoy con tanta tecnología es imposible escapar de algo como lo sucedido el día de pascua. Además es un acto publico. lo que me molesta es que estaban en una MISA de PASCUA de renovación, es un acto religioso. y no veo absolutamente nada de malo que la abuela se quiera tomar una fotografía con sus nietas. You are totally wrong, the ceremony was over when when everything started. 15 seconds in someone's life don’t determine a relationship. Besides, we don't know what happened, words that were spoken or left unspoken. A royal famlily is not a family like any other, , there are other provisions of the Protocol, and if there is a rule for photos you get to know when to hold. The whole issue is a bit of an exaggeration. I agree on the fact that the first thing that came to my mind was just that: what is Letizia thinking at the end of the Easter mass? I can’t possibly say, but she doesn’t strike me as a deeply religious person. I don’t want to go into this, but more than anything her attitude shows disrespect towards the church, first and foremost. Not to mention, like others have before, that Queen Sophia is the most dignified royal around, an exemplary family matriarch (who has been credited with supporting her son when he wanted to marry Letizia and his father opposed), so it is most appalling that she acted the way she did. This outing was best kept private. Them inviting the press makes it feel like they’re trying too hard. Nobody is perfect, so it’s best you realize that there was a mistake and just move on. Not try to overcompensate or pretend it wasn’t what everyone saw. Nobody is perfect and that’s that. Including the pretty-dress-wearing Queen Letizia. That’s alright. Just be honest. Disrespect for the church is perhaps going a bit too far. Everyone sees what they want to see. She crossed over to the side of the infant to shake hands with the lady who was left with the hand outstretched. On the way back she looks at the girls and approaches Leonor not realizing that she is in front of the photographer. That is when she realizes that Sofia is up to something and initiates a conversation. The princess removes Sofia's arm and the kids are dragged towards a better camera angle. Where is the disrespect? And please, the catholic church is not precisely an example of morality. Worship your deity of preference, but do not question the religious fervor of another. ..With time and distance, it seems that Letizia was the only one in the group who did not know about Sofia's posada. Très franchement on s'en fiche complètement de leur dispute... ils ont le droit de se disputer... comme tout le monde. Les deux jeunes filles sont bien mignonnes. Tout à fait d'accord avec vous Rose ! I believe there is a problem, all families have them. It is unfortunate it was played out in public. It reminded me of the sort of thing the Prince of Wales and his first wife use to engage in. Just enough to let the public know that one of the participants is unhappy with something going on behind the scenes. All I can think of saying: Who invited the press? Qué ingenuidad. La prensa no necesita invitación. Desde el momento en que JC entró en el hospital montan guardia día y noche. Il y a des disputes dans toutes les familles.. Letizia a parfois dérogé au protocole, elle ne peut le reprocher a sa belle-mère, si c'est le cas. De plus, tout le monde sait qu'elle aime être en contrôle. L'important c'est qu'elle accomplisse bien son travail. C'est dommage qu'ils jouent autant la comédie. La pertinence de leur rôle est souvent remise en question , ils doivent faire attention à leur comportement en public. I have seen a few videos on YouTube and I still view Easter's event from the point of view of guiding a 12 year old developing her sense of self, AND guiding the heir presumptive who has the right to not be touched. There are at least 2 videos that show the bodyguards starting to enter the cathedral. Who better to be Leonor's bodyguard than her mother, rather than 6 foot tall palace guards when the person who needs to step back is the emerita and grandmother. Spain has had problems with domestic terrorism in the past. Nowadays, there are people w/cellphones who might want to run up to the girls and take a selfie. There are reasons for a heightened sense of security. As a footnote, the woman with the outstretched hand when Sofia pulled the Infanta away ended up shaking hands w/both Letizia and Felipe. They made things right. Here at the hospital, there is a different story. There is a person undergoing surgery and the spouse deserves the love and support of the family. It can be nerve racking until it is known the patient came out of anesthesia alright. Family dynamics can change from day to day. 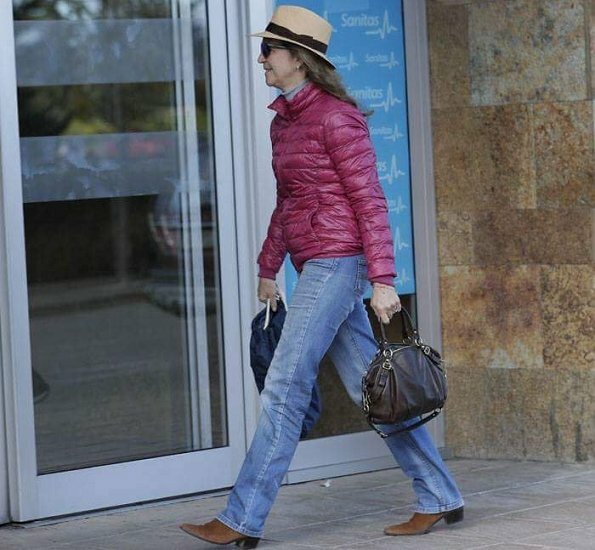 Letizia looks great is straight leg jeans, much prefer this look to skinny leg jeans.